Severe soil erosion in a wheat field near Washington State University, U.S.A. In geology and environmental science, erosion is the displacement of solids (soil, mud, rock and other particles) by the agents of wind, water, ice, or living organisms, or by down-slope movement in response to gravity. Erosion needs to be distinguished from weathering, although the two processes may be concurrent. Weathering refers to the decomposition of rock and minerals through processes involving no movement, that is, no physical removal of material. Erosion is a natural process, moving material and nutrients from one place to another and converting rock into soil. Thus a certain degree of erosion is healthy for the ecosystem. Excessive erosion, however, can damage the ecosystem, such as by increased water sedimentation or the outright loss of soil. 5 Origin and alternative meanings of "erosion"
In many places, erosion is heightened by human land use. Poor land-use practices include deforestation, overgrazing, unmanaged construction activity, and road or trail building. On the other hand, improved land-use practices can limit erosion, by techniques such as tree planting and terrace-building, or leveling of the land interrupting steep slopes. Erosion is governed by a combination of factors, including the amount and intensity of precipitation (particularly rain), soil texture, gradient of the slope, ground cover (from vegetation, rocks, and so forth), and land use. Of these, the main agent of erosion is rainfall. In general, if one compares areas with the same degree of vegetative cover, erosion tends to be higher in areas with high-intensity precipitation, sandy or silty soils, and steep slopes. On the other hand, there is less erosion of soils with a higher content of clay, situated along lower slope gradients, and receiving less intense precipitation. Among the factors listed above, the one most likely to change over time is the amount and type of ground cover. When fires burn an area, or when vegetation is removed during timber operations or house or road construction, a soil's susceptibility to erosion is greatly increased. Road construction can increase the rate of erosion because, in addition to removing vegetative ground cover, it can significantly alter drainage patterns. However, erosion is minimized if the road has a lot of rock and is "hydrologically invisible," that is, the water flows off the road as quickly as possible, mimicking natural drainage patterns. Bank erosion started by four-wheeler, all-terrain vehicles in Yauhanna, South Carolina. Changes in the type of vegetation in an area can also affect erosion rates. Different kinds of vegetation have an effect on the rates of infiltration of rain into the soil. Forested areas can take up water at higher rates, so precipitation there results in less surface runoff, and subsequently, less erosion of surface materials. In these areas, much of the water goes into subsurface flows, which are generally less erosive. Leaf litter and low shrubs also contribute to the high infiltration rates of forested systems, and removing them can lead to an increase in erosion rates. Leaf litter also shelters the soil from the impact of falling raindrops, which is a significant agent of erosion. Vegetation can also change the speed of surface runoff flows, so the presence of grasses and shrubs plays an important role in this respect as well. Many human activities, such as logging and heavy grazing by livestock, can reduce an area's vegetation, making the soil more susceptible to increased erosion. One of the main causes of erosive soil loss in the year 2006 was the result of "slash-and-burn" treatment of tropical forests. When the total ground surface is stripped of vegetation and seared of all living organisms, the upper soils are vulnerable to erosion by both wind and water. In a number of regions of the world, entire sectors of a country have been rendered unproductive. For example, on the Madagascar high central plateau, constituting approximately 10 percent of that country's land area, virtually the entire landscape is sterile of vegetation, with gully erosive furrows scattered along the landscape—typically more than 50 meters deep and one kilometer wide. Shifting cultivation is a farming system that sometimes incorporates the slash-and-burn method in some regions of the world. When land is overused by human and animal activities, there can be mechanical erosion as well as removal of vegetation, leading to erosion. In the case of animals, one sees this effect primarily with large herd stampedes, such as the Blue Wildebeest on the Serengeti plain. Even in this case, there are broader material benefits to the ecosystem, such as continuing the survival of grasslands indigenous to that region. This effect may be viewed as a problem only when there is a significant imbalance or overpopulation of one species. In the case of human use, the effects are also generally linked to overpopulation. For example, when large numbers of hikers use the same trails, or when there is extensive off-roading by vehicles, erosive effects often follow, arising from vegetation removal and furrowing of the soil. These effects can also accumulate from a variety of outdoor human activities, again arising from too many people using a finite land resource. One of the most serious and long-running water erosion problems worldwide is in China, around the middle reaches of the Yellow River and the upper reaches of the Yangtze River. From the Yellow River, over 1.6 billion tons of sediment flow into the ocean each year. The sediment originates primarily from water erosion in the Loess Plateau region of northwest China. A heavily eroded roadside near Ciudad Colon, Costa Rica. "Mass wasting" is the down-slope movement of rock and sediments, caused mainly by the force of gravity. Mass wasting is an important part of the erosion process, as it moves material from higher elevations to lower elevations, where transporting agents like streams and glaciers can pick up the material and move it further down. Mass-wasting processes occur continuously on all slopes. Some of these processes take place very slowly; others occur very suddenly, often with disastrous results. Any perceptible down-slope movement of rock or sediment is often referred to in general terms as a "landslide." There are, however, more detailed ways of classifying landslides, reflecting the mechanisms responsible for the movement and the velocity at which the movement occurs. One visible topographical manifestation of a very slow type of landslide is a scree slope. "Slumping" is a form of mass-wasting in which consolidated materials or rock layers move together a short distance down a slope. Slumping happens on steep hillsides, and often with materials like clay that, once released, may move rapidly downhill. The area left behind by the moving material often shows a spoon-shaped depression. In some cases, the slump is caused by water beneath the slope, weakening layers of rock above it. In many cases, it is simply the result of poor engineering along highways, where it is a regular occurrence. "Surface creep" is the slow movement of soil and rock debris by gravity. It is usually not perceptible, except through extended observation. This term, however, is also used to describe the rolling of dislodged soil particles (0.5 to 1.0 mm in diameter) by wind along the soil surface. A nearly perfect sphere of granite, in Trégastel, Brittany. "Splash erosion" is the detachment and airborne movement of small soil particles, caused by the impact of raindrops falling on the soil. "Sheet erosion" is the result of heavy rain on bare soil, where water flows as a sheet down a gradient, carrying soil particles. In any area where precipitation rates exceed the absorption and infiltration rates into the soil, runoff occurs. Surface runoff turbulence can often cause more erosion than the initial raindrop impact. 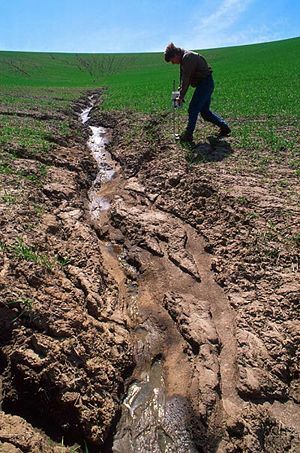 "Gully erosion" occurs in places where water flows along a linear depression, eroding a trench or gully (a furrow in the soil that is more than one meter deep). "Valley" or "stream erosion" takes place with continued water flow along a linear feature. The erosion is both downward, deepening the valley, and headward, extending the valley into the hillside. In the earliest stage of stream erosion, the erosive activity is dominantly vertical, the valleys have a typical V-shaped cross-section, and the stream gradient is relatively steep. When some base level is reached, the erosive activity switches to lateral erosion, which widens the valley floor and creates a narrow floodplain. The stream gradient becomes nearly flat and lateral deposition of sediments becomes important as the stream meanders (twists and turns) across the valley floor. In all stages of stream erosion, by far the most erosion occurs during times of flood, when greater amounts and faster-moving water is available to carry a larger sediment load. In such processes, erosion is caused not only by water but also by suspended abrasive particles, such as pebbles and boulders, as they traverse the surface. 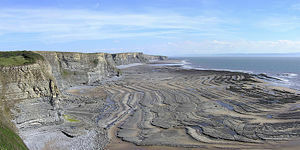 Wave-cut platform caused by erosion of cliffs by the sea, at Southerndown in South Wales. 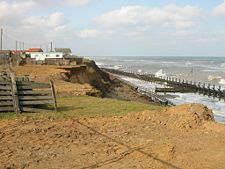 Coastal erosion at Happisburgh, Norfolk, England. Shoreline erosion, on both exposed and sheltered coasts, occurs primarily through the action of currents and waves, but sea level (tidal) changes can also play a role. When the sheer energy of a wave hitting a cliff or rock breaks pieces off, this is known as wave pounding. "Abrasion" or "corrasion" is caused by waves launching seaload at the cliff. It is the most effective and rapid form of shoreline erosion. (Corrasion should not to be confused with corrosion, or the dissolving of rock by carbonic acid in seawater. Limestone cliffs are particularly vulnerable to this type of erosion). Finally, "attrition" is where particles/seaload carried by the waves are worn down, as they strike one another and rock surfaces like cliffs, making the material easier to wash away. Sediment is transported along the coast in the direction of the prevailing current (known as "longshore drift"). Erosion occurs when the uptake of new sediment by the upcurrent is less than the amount being carried away. When the upcurrent amount of sediment is greater, sand or gravel banks will tend to form. These banks may slowly migrate along the coast in the direction of the longshore drift, alternately protecting and exposing parts of the coastline. Where there is a bend in the coastline, quite often a buildup of eroded material occurs, forming a long, narrow bank (or "spit"). Underwater sandbanks offshore may also protect parts of a coastline from erosion. Over the years, as the sandbanks gradually shift, the erosion may be redirected to impact different parts of the shore. "Ice wedging" is the weathering process in which water trapped in tiny cracks of rock freezes and expands, breaking the rock, allowing for gravity erosion on steep slopes. The scree that forms at the bottom of a steep mountainside is mostly formed from pieces of rock broken away by this means. It is a common engineering problem, wherever rock cliffs are alongside roads, because morning thaws can drop hazardous rock pieces onto the road. In some places that are cold enough , water seeps into rocks during the daytime, then freezes at night. Ice expands, thus, creating a wedge in the rock. Over time, the repetition in the forming and melting of the ice causes fissures, which eventually breaks the rock down. Wind erosion, also known as "eolian erosion," is the movement of rock and sediment by wind. The wind causes dust particles to be lifted up, where they can be moved to other regions. Wind erosion generally occurs in areas with little or no vegetation, often in places where there is insufficient rainfall to support vegetation. An example is the formation of sand dunes on a beach or in a desert. Farmers often plant windbreaks to reduce wind erosion. This includes the planting of trees, shrubs, or other vegetation, usually perpendicular (or nearly so) to the principal wind direction. Bioerosion involves the erosion of hard ocean substrates by living organisms, utilizing a number of mechanisms. It can be caused by mollusks, polychaete worms, sponges, crustaceans, echinoids, and fish. It can occur on coastlines and coral reefs, and on the hulls of ships. Mechanisms of bioerosion include biotic boring, drilling, rasping, and scraping. Bioerosion of coral reefs generates the fine and white coral sand characteristic of tropical islands. The coral is converted to sand by internal bioeroders such as algae, fungi, bacteria, sponges (Clionidae), bivalves (Lithophaga), sipunculans (Aspidosiphon), and polychaetes (Eunicidae), generating extremely fine sediment (10 to 100 micrometers in diameter). External bioeroders include urchins (Diadema) and chitons (Acanthopleura). The combination of these internal and external bioeroders results in a great deal of erosion. Sea urchin erosion of calcium carbonate (CaCO3) at some reefs has been reported to occur at annual rates exceeding 20 kg/m². Fish also erode coral while eating algae. Parrotfish cause a great deal of bioerosion, as a result of their well developed jaw muscles and tooth armature, and a pharyngeal mill that grinds up ingested material into sand-sized particles.. When erosion involves the removal of large amounts of rock from a particular region and its deposition elsewhere, it can lighten the load on the lower crust and mantle. This can cause tectonic or isostatic uplift in the region. Research undertaken since the early 1990s suggests that the spatial distribution of erosion at the surface of an orogen (mountain-forming belt of rock along a tectonic plate) can exert a key influence on its development and its final internal structure. Erosion control is the practice of preventing or controlling wind or water erosion in agriculture, land development, and construction. It usually involves the creation of some type of physical barrier, such as vegetation or rock, to absorb some of the energy of the wind or water causing the erosion. Some examples of erosion control methods are given below. Conservation tillage: It is used as a way to conserve soil and water resources as well as to mitigate the problems of erosion by tilling strips of soil for planting new crops and maintaining untilled portions of the land to serve as anchors for the soil. Terracing: This agricultural technique aids in planting along sleep slopes by breaking each slope into a series of slopes that are shorter and less steep, slowing down runoff and preventing water erosion. Cover crops: These are any surface crops planted annually, biennially, or perennially, in conjunction with other crops or alone. They last through a part of a year or even an entire year, preventing erosion of the soil by wind and water. Cover crops are used as a means of sustainable cropping, preventing weeds, and reducing the leaching of nutrients from the soil. Riprap and gabions: Riprap consists of rock or other material placed along a shore. It reduces shoreline erosion by protecting the land from the full impact of fast-flowing waves. Caged riprap structures are known as gabions. Hydroseeding: Also referred to as hydromulching, it is a quick, economical, and effective means of establishing ground cover by planting grass in large areas of exposed soil. The seeds are mixed together in a slurry of mulch and other essential fertilizers and sprayed uniformly across the soil, creating a favorable, nutrient rich environment for the germination and establishment of grass seedlings into the soil. Mulching: It is a process that uses mulch to cover and protect the soil from water erosion and to maintain moisture in the soil. Reforestation: This method of mitigating soil erosion consists of restoring forests and woodlands in areas that were once deforested or stripped of vegetation. Riparian strips: These are regions along a riverbank characterized by the growth of vegetation. They stabilize the soil and serve as natural controls against runoff and soil erosion. Strip farming: It is used in steep, sloping areas to prevent soil erosion. In strip farming, alternating row and more tightly grown crops are sown next to one another, to stabilize the soil and enhance water retention and percolation. Vegetated waterways: These are channels developed to stabilize and direct runoff in such a way as to reduce erosion. Wattle (construction): It is an organization of interwoven plant materials used as a fence, preventing sedimentation by runoff and erosion. Windbreaks: Also known as shelterbelts, they involve the planting of trees or shrubs along distinct parameters or in an arranged pattern to reduce erosion by wind. Origin and alternative meanings of "erosion"
The first known occurrence of the term "erosion" was in the 1541 translation by Robert Copland of Guy de Chauliac's medical text, The Questyonary of Cyrurygens. Copland used erosion to describe how ulcers developed in the mouth. By 1774, "erosion" was used outside of medical subjects. Oliver Goldsmith employed the term in the more contemporary geological context, in his book Natural History, with the words "Bounds are thus put to the erosion of the earth by water." In materials science, erosion is the recession of surfaces by repeated localized mechanical trauma as, for example, by suspended abrasive particles within a moving fluid. Erosion can also occur from nonabrasive fluid mixtures. Cavitation is one example. The concept of erosion is commonly employed by analogy to various forms of perceived or real breakdown, removal (such as 'erosion of boundaries'), "leveling out," or even the decline of anything from morality to indigenous cultures. It is a common trope of the English language to describe erosion as the gradual, organic transformation of something considered distinct, more complex, harder to pronounce, or more refined into something indistinct, less complex, easier to pronounce, or (disparagingly) less refined. ↑ "Terrace" The Free Dictionary by Farlex. ↑ Parts adapted from 'Slump' in Wikipedia. ↑ Anders Rapp, "Soil Erosion and Sedimentation in Tanzania and Lesotho." Ambio 4 (4): 154-163. Royal Swedish Academy of Sciences, 1975. ↑ David Alt. Glacial Lake Missoula & its Humongous Floods. (Mountain Press Publishing Company, 2001. ISBN 0878424156). ↑ Lyn Topinka, Topinka, Lyn, "Glacial Lake Missoula and the Missoula Floods". USGS/Cascades Volcano Observatory, Vancouver, Washington, July 5, 2002. Accessed on November 28, 2006. ↑ "Drumlin" The American Heritage Dictionary of the English Language, Fourth Ed. (Houghton Mifflin Company, 2000).Retrieved May 24, 2008. ↑ "Moraine". The American Heritage Dictionary of the English Language, Fourth Ed. (Houghton Mifflin Company, 2000). Retrieved May 24, 2008. ↑ Bioerosion of reef calcium carbonate by parrotfish can range from 1017.7±186.3 kg yr-¹ (0.41±0.07 m³ yr-¹) for Chlorurus gibbus and 23.6±3.4 kg yr-¹ (9.7 10-³±1.3 10-³ m²yr-¹) for Chlorurus sordidus. D.R. Bellwood, "Direct estimate of bioerosion by two parrotfish species, Chlorurus gibbus and C. sordidus, on the Great Barrier Reef, Australia." Marine Biology 121(3)(1995): 419-429. ↑ Mary Peet, "Sustainable Practices For Vegetable Production in the South: Conservation Tillage". New York State University, October 2001. Retrieved May 24, 2008. ↑ "Backyard Conservation Tip Sheet: Terracing" Natural Resources Conservation Service. NRCS.USDA.gov.Retrieved May 24, 2008. ↑ Preston Sullivan, Sullivan, Preston, "Overview of Cover Crops and Green Manures: Fundamentals of Sustainable Agriculture" National Sustainable Agriculture Information Service. ATTRA, 2003. Retrieved May 24, 2008. ↑ "Vegetated Waterways" Resource Conservation District of Monterey County, 2005. Retrieved May 24, 2008. China: Air, Land, and Water: Environmental Priorities for a New Millennium Washington, DC: The World Bank, 2001. ISBN 0821349376. Nature and Extent of Soil Erosion in Europe European Commission. Retrieved December 4, 2006. Morgan, R.P.C. (ed.) (1986). Soil Erosion and Its Control. Van Nostrand Reinhold Science Series. New York: Van Nostrand Reinhold Company. ISBN 0442264410. Rapp, Anders. "Soil Erosion and Sedimentation in Tanzania and Lesotho." Ambio 4 (4): 154-163. Royal Swedish Academy of Sciences, 1975. Michael Pidwirny Soil erosion and deposition The Encyclopedia of Earth. This page was last modified on 16 August 2017, at 15:13.